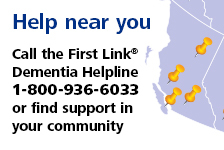 Volunteer with us | Alzheimer Society of B.C. Volunteers are vital to the energy and success of the Society. Dedicated individuals, in communities throughout B.C., volunteer in a wide variety of activities that expand and strengthen our ability to provide quality programs, support and services. Thank you everyone for being a part of our team. Join a team of volunteers dedicated to a world without Alzheimer’s disease and other dementia, and who ensure people living with the disease are welcomed, acknowledged and included until that day comes. Read about our current volunteer opportunities. Every year, the Society recognizes several outstanding volunteers – those who best represent our key core values of compassion, integrity and respect, leadership and teamwork. Meet our award-winning volunteers.